Is there an active, meaningful role for the arts and creative arts therapies in addressing this vast array of critical human readiness issues across the military continuum? In general, "readiness" is the #1 issue for the military at all times. The connection of the arts to the human dimension of readiness is key. Military leaders say we need every weapon in our arsenal to meet the many challenges we face today. However, one of the most powerful tools we have in our arsenal -- the arts -- is often under-utilized and not well understood within the military and the healthcare system. The arts and creative arts therapists are -- and have been -- a part of military tradition and missions across all branches, supporting military health services, wellness, and mission readiness, including family support. For example, the War Department ordered the use of music in rehabilitation for the war wounded in World War II. In June 1945, the Department of War issued "Technical Bulletin 187: Music in Reconditioning in American Service Convalescent and General Hospitals." This bulletin was a catalyst for the growth and development of music therapy being used as a rehabilitative service for active duty service members and veterans alike during and after WWII. Although many gaps exist in our knowledge regarding the arts in military settings, what we do know to date holds great promise for powerful outcomes for our service members, veterans, their families, and the individuals who care for them. Today, a growing number of members of the public and private sectors are eager to collaborate with military leaders to help make these outcomes a reality. Nowhere was the momentum for greater collaboration more evident than in October 2011, when the first National Summit: Arts in Healing for Warriors was held at Walter Reed National Military Medical Center (now referred to as Walter Reed Bethesda) and the National Intrepid Center of Excellence (NICoE). Rear Admiral Alton L. Stocks, Commander of Walter Reed Bethesda, hosted the National Summit, in partnership with a national planning group of military, government, and nonprofit leaders. The 2011 Summit marked the first time various branches of the military collaborated with civilian agencies to discuss how engaging with the arts provides opportunities to meet the key health issues our military faces -- from pre-deployment to deployment to homecoming. 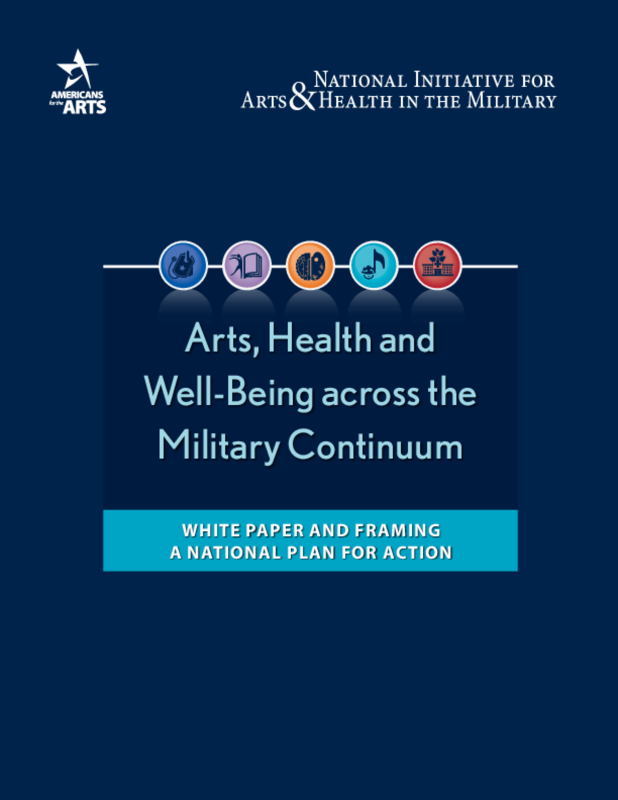 Building upon its success, a multi-year National Initiative for Arts & Health in the Military was established in 2012, with the advice and guidance of federal agency, military, nonprofit, and private sector partners (see Figure 2). The National Initiative for Arts & Health in the Military (National Initiative) represents an unprecedented military/civilian collaborative effort whose mission is to "advance the arts in health, healing, and healthcare for military service members, veterans, their families, and caregivers." 3. Make the arts as tools for health available to all active duty military, medical staff, family members, and veterans.